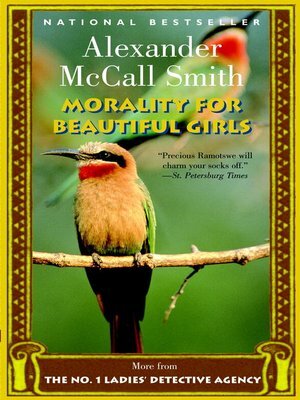 In Morality for Beautiful Girls, Precious Ramotswe, founder and owner of the only detective agency for the concerns of both ladies and others, investigates the alleged poisoning of the brother of an important "Government Man," and the moral character of the four finalists of the Miss Beauty and Integrity Contest, the winner of which will almost certainly be a contestant for the title of Miss Botswana. Yet her business is having money problems, and when other difficulties arise at her fiancé's Tlokweng Road Speedy Motors, she discovers the reliable Mr J.L.B. Matekoni is more complicated then he seems.